Incineration cycle is started with the push button. Both heater and blower come on when button is pushed. Heater alternates off and on for a preset period of time, blower continues on until unit has cooled. Several people may use the toilet in rapid succession. Push the start button after each use to reset the timer. 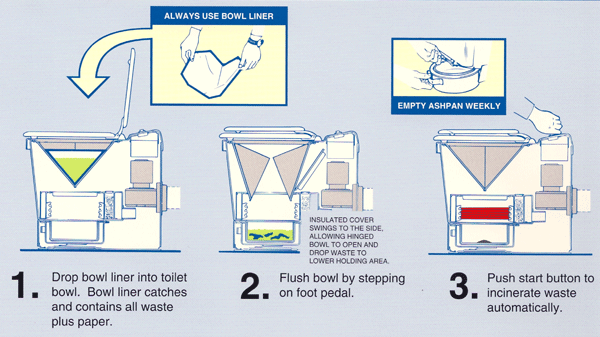 Odor Waste is incinerated after each use - keeps bathroom free of odor and flies. Catalyst within the toilet keeps exhaust odor-free. Waste accumulates and decomposes over a 3-6 month period of time - user can see accumulated waste and some insects may be attracted. Water Uses no water. Some models use water and must be plumbed. Additives Nothing to add. Peat moss must be added after every 3-4 uses. Other "food" for microbes must be added from time to time. Residue Ash produced is germ-free - no restrictions on its disposal. Compost produced must be put out onto the ground, but cannot be used as fertilizer for food producing plants. Some models drain excess urine out into a pit or an old septic system. Climate Can be used in any climate and can be left in an unheated environment for long periods of time. Microbes must be kept warm and must be "fed" from time to time or they die, stopping the composting process and leaving raw sewage in the toilet or composting vault. Waste must be "stirred" periodically. Electrical Requirements Uses 120 volts (some 240 volt models), at 15 amps. Uses about 1½ kilowatt hour of electricity per cycle. Electric drawn only when toilet is in use. Electric models use 120 volts. Electricity may be needed all the time, even during off seasons, to operate evaporation fan and heater.